we are rushed, not the king and queen. The king and queen still met war veterans at the stadium, so that is good. According to Marlene Koenig, the meeting with several parlementarians was rushed. The king and queen also met Nancy Pelosi and her family. 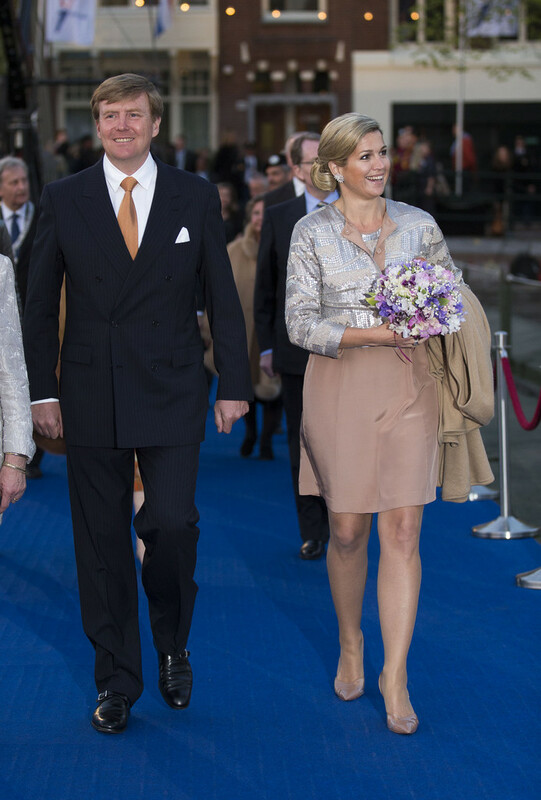 Her daughter Alexandra is married to a Dutch journalist and documentary maker Michiel Vos, with whom she has two children. I covered all the DC events, except World Bank. State visits are rare these days in Washington, as current admin prefers less formal working visits. The state visit to Canada was linked to the celebration of the 70th anniversary of the liberation of the Netherlands by Anglo-Canadian forces, wasn't it ? The King and Queen attended a Dance-music seminar and unexpectedly joined the Dj's on the podium. There is a short video if you click on the picture and scroll right. The queen on the other hand seems to have lost some weight. Which wasn't really needed IMHO, but good for her. The weight: he appeared a bit chubby in the late 90-ties which was later revealed to have been caused by the use of medicine. We do not know what causes his present weight, but perhaps it is best to hope that it is good food. Apart from that, the king might consider a new hairstyle. Something less Donald Trumpesque. Although I am sure they have next to no coverage in the US, I am surprised that the visit doesn't get that much coverage in The Netherlands either. Not exotic or controversial enough to be interesting perhaps. Just a photo somewhere in the newspaper of a smiling King and Queen with a short caption . NOT happy. the security was VERY tight today in Chicago...overdone. I waited two hours and between the federal agents and the secret service and the Chicago PD, you would have though the president was coming. They got out of their car and smiled and waved, but were basically pushed into the building while serious looking agents kept everyone away. During the Q&A with the press at the end of the visit, the king answered some questions about the restauration costs for Huis ten Bosch. He emphasized that the building is owned by the state and that the state decides what has to be done, not him. The queen will not return to the Netherlands just yet, as she is in the US anyway, it was handy to combine these visits with a visit to the UN in New York. As a side note: the largest gossip magazine has used pictures of banquet in Canada and suggested that the queen is too drastic with her weight loss. Although the State (should) decide what needs to be done, I highly doubt it is as clear as the King suggests. Millennium Park/Grant park in Chicago is a happening place and I'm thrilled the couple wandered out to listen to the music. The combined park is 2.28 sq km. Fountains, outdoor stage, theatre, memorials, ice rink, formal and informal gardens, play spaces, quiet spaces, plazas, pavilions, promenades, sculpture parks and lake views abound. There is always just something worth doing going on there. It's adjacent to the Art Institute of Chicago and the old shopping district. Perfect place for the King and Queen to cap off their tour. Good for them. All newspapers had the picture of the King with Obama on FrontPage. Yesterday a special program was broadcast on the visits to Canada and the USA. Every evening in the News on all channels (NPO, RTL, etc.) there was attention for it, besides the usual daily society programs as RTL Boulevard, Heart of the Netherlands, commenting fashion, etc. Coming Saturday "Blauw Bloed" will have a special on this visit. Comparing with -for an example- what I can see from the Belgian or the British television (I can receive VRT, RTBf, BBC 1 and 2, Sky, ITV, Channel 4 and 5) I have the idea the Dutch have more attention for such visits. I never see any special when the King of the Belgians or the Queen of the UK has made a State Visit. Only an item in the News. that is quite the norm for heads of state, etc .. Secret Service keeps people at a distance these days, especially after 9-11. When William and Catherine were in NYC, there were no crowds because State Dept (they don't get SService) and NYPD kept people away, down streets, across streets, etc.